- Applications - Used For comparison of capacity of conductor. Humidity : Less Than 85% Rh , Non Condensing. - Digester Volume 10, 20, and 50 Liters, other capacity are available. - Card Holder .hard Board Sheet With 204opertures for dia Tubes Or 150 Apertures for 3/4dia Tubes Fixed Inside. To show that the level of liquid in communicating vessels is constant irrespective of the size or shape of the vessels. 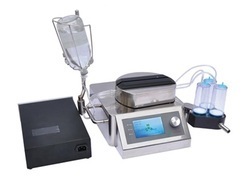 The apparatus comprises four glass tubes of different shapes and cross sectional area projecting vertically from a common horizontal tube. The tubes are mounted on a polished wooden base. Owing to devoted experts, we have been competent to present a wide range of Pulley Bench Mounting. These products are made as per industry norms and standards. This demonstation kit shows series and parallel arrangement of resistance with digital meters. 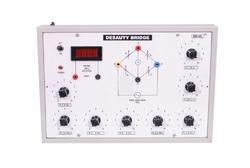 this instrument also demonstate how series & parallel resistance effects on current as well as voltage. The sampler is used for every steel plant to take sample in Arc Furnace, Ladle and Tundish. These are used for process analysis of molten metal for instantaneous sample techniques and reinforce quality control.